A £100m programme of works announced by the DfT in June 2018 under the Safer Roads Fund is on course to prevent almost 1,450 road deaths and serious injuries over the next two decades. That is the assessment of the Road Safety Foundation and the RAC Foundation after analysis of dozens of schemes awarded money from the Fund. The work programme is based on the Safe System approach which uses road engineering to try and prevent crashes from happening in the first place. Safe System working recognises that humans are ‘error prone’ and some crashes are inevitable. To improve the survivability of these crashes roads and roadsides are reengineered to make them more forgiving when an incident occurs. The £100m from the Safer Roads Fund is being used to improve safety along 48 of the country’s ‘riskiest stretches of council-managed A roads’. 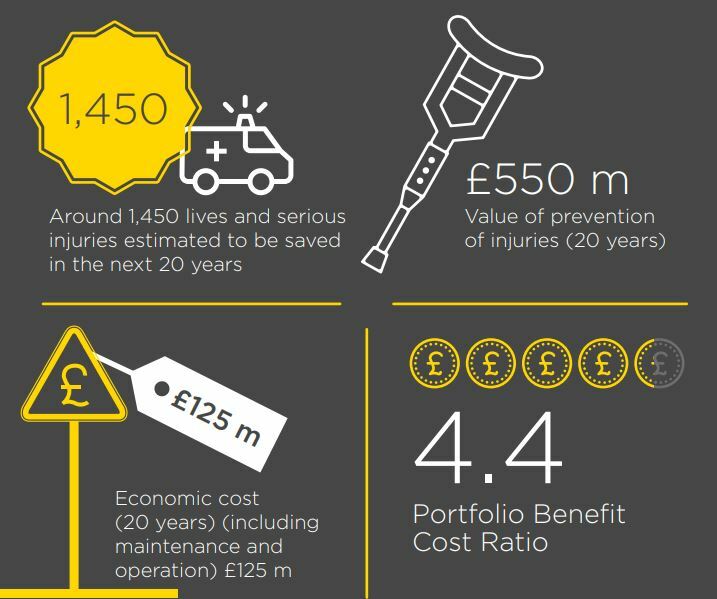 The analysis by the Road Safety Foundation and the RAC Foundation estimates the total value of the prevention of harm across the 48 schemes, over a 20-year period, to be £550m. The total economic cost of the project over the 20 years will be £125 million – the initial £100 million capital investment plus £25 million of ongoing costs. Given the projected benefits of £550 million this means that for every £1 spent, there will be a societal benefit of £4.40.